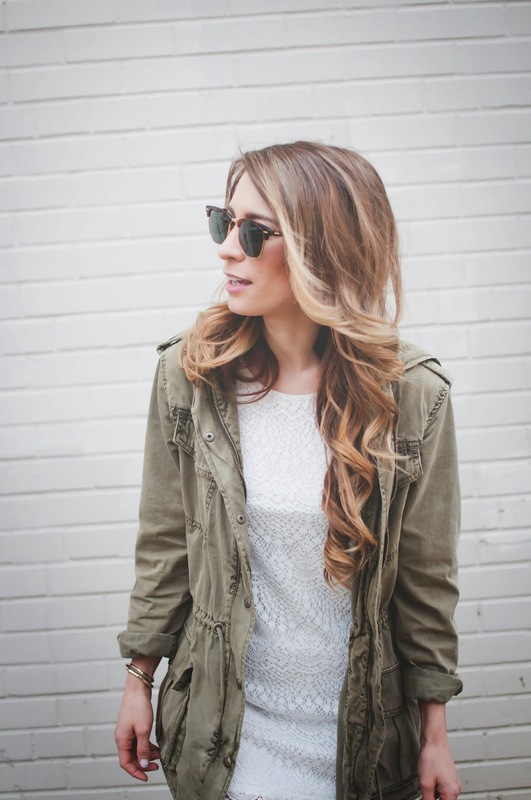 OOTD - Lace Dress + Military Jacket | La Petite Noob | A Toronto-Based Fashion and Lifestyle Blog. Happy Good Friday, Noobs! Imagine my delight when I found out that I had the holiday off (a rarity in my line of work), and then my crushing disappointment when I saw the weather forecast for the day - clouds and rain. Already having planned to wear a delicate white knit dress for the day, I decided to stick with the plan but make some alterations. Boots replace heels, and a military jacket as a substitute to a blazer. Add in a pair of androgynous sunglasses, and my original vision is a little more weather appropriate. Read on for additional photos and outfit details. These Frye boots are some of my favourites. The quality of the leather is incredible - so soft, they require no time to break in. The heel is a perfect height too, and I could walk for days in these boots. I told my husband that I felt like John Lennon in this outfit - he told me that I was crazy! The Ray Ban club master sunglasses took me a little longer to warm up to - I originally found them to be a bit too masculine for my tastes, but gradually started to appreciate their timeless shape and ability to add instant casualness. Have a great start to the long weekend! I love love love this outfit!! I love styling white with military jackets!! And the boots are just go perfectly!! Thank you, I agree - the boots are the best part! Parka looks so good with the lace dress! Could you check out my blog and follow it on bloglovin? I will follow back immediately. This is a great look! Love that dress. Ok seriously love this outfit - the parka and boots make it a more casual look. I am in love with your blog girl! Absolutely adore the lace paired with a parka; the perfect mix of feminine and tough ♥ Your blog is great too, going back to check out past posts now!